Several weeks ago I was having lunch with one of my “new” sisters. Well, technically she is a half-sister but I, like her, prefer to round up. We were united about seven months ago. When I met her for the first time, she was six months pregnant with her first child and glowing in her pregnancy. She, and her sister – make that our sister – found out about their “new” brother only a day before we met for the first time over dinner the next evening. Up until my contact with my birth parents – in this case their father (I’m the brother from another mother) – neither of them knew of my existence! I can only imagine that being on the receiving end of such a massive reveal is somewhere in the category of head-splitting with dollops of shock, incredulity, and wonderment piled on top. Yet, the moment the bombshell dropped they wanted to meet me as soon as possible. 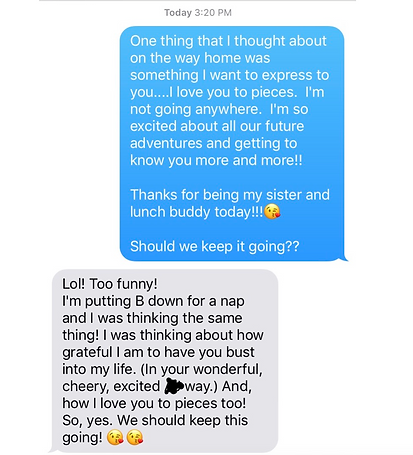 I talked on the phone with this particular sister the day after our initial reunion. She admitted that she had cried a lot after our dinner and woke up the next morning feeling as if her soul was now, finally, complete. She told me that she had always wanted a brother, and now that dream was fulfilled. Over the years I did wonder about biological siblings. Not because I wanted a replacement for the one I had, who is also adopted. Not at all. The older I became the more I wanted to know if a sibling out there looks like me, thinks like me, likes what I like and hates what I do. Would we find humor in the same things? What physical characteristics would we share? Are our food preferences the same? Do we enjoy the same sports? Would we experience an immediate genetic bond, or would our relationship be slow growing or maybe even strained? On the drive home after lunch, this comment spun around in my mind. I kicked myself for not addressing it better when we were together. At the time, I had casually brushed it off but now, on the drive home, I realized that maybe there was a deeper level of concern that I ought to have been more aware of. I have spent a lot of time with this side of my biological family and the thought of “breaking up” has never crossed my mind. Over the past few months we’ve BBQ’d, shared birthdays, attended baby showers, enjoyed dinners in the park, met for lunch, been introduced to our close friends, and so forth. I love them, how could I possibly move on? When I arrived home I sent her a text. For some reason these words touched my soul. In full candor, I reread this exchange multiple times and with each passing read I felt more empowered and centered within myself. A rolling sense of calm washed over me like gentle, warm waves. Knowing that my flesh and blood sister felt this way? An indescribable profound something was actually filling my soul now. Was I, perhaps, experiencing ultimate completeness? 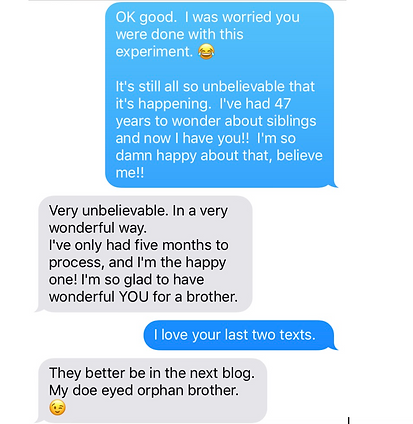 A few days after this text exchange we met again for lunch and dove into the power of the genetic bond and affirmed what we mean to each other and how incredible this connection felt. Taking things one step further, she explained that my arrival in her life filled a hole within her that she never knew she had, until she met me. Wow. While I had those earlier questions about what biological siblings would be like, I was blind to the fact that I could feel a new, elevated sense of who I am just by having them in my life. Maybe, to know each other is to complete each other. Regardless of how my other new siblings feel about my arrival into their lives, I do know that their presence in mine has fundamentally changed me for the better. This emotional experience, and new sense of being, is very hard to describe. I think the best that I can do is to say it is totally profound awesomeness. PS-You made the blog, sis.